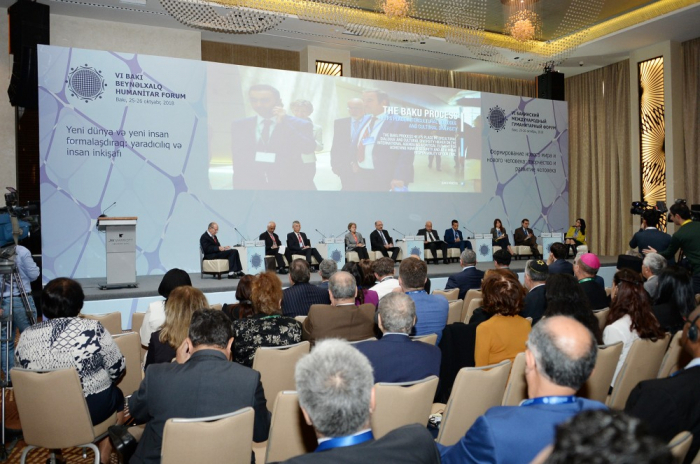 The 3rd Plenary Session of the 6th Baku International Humanitarian Forum marks the 10th anniversary of the “Baku Process”. Held under the motto “Baku Process – Advancıng Intercultural Dıalogue for Human Securıty, Peace and Sustainable Development: 10 Years Lessons and Perspectıves”, the session is moderated by Abulfas Garayev, Azerbaijani Minister of Culture. Abdulaziz Othman Altwaijri, Director General of ISESCO, Qu Xing, deputy director-general of UNESCO, and Irina Bokova, former director-general of UNESCO hailed the Azerbaijani President`s initiative to launch the “Baku Process”.